Not bad. Is a little hard to see the background. I do like the group picture. A Seigaku team pic! This is a really great idea. The only thing I can see wrong with this wall is the photos in the background. Some of them are transparent! If you could make them not transparent, then they would look more like real photos. I love this !! This is so cool !!! Awesome work !! Tezuka-buchou is so handsome and cool !! Thank for sharing it with us !! 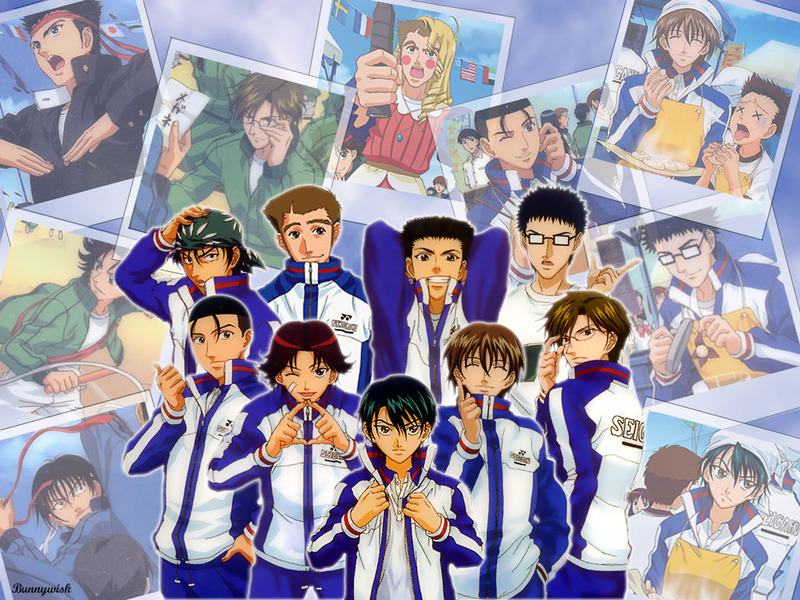 I like the collage of pictures for the background, especially for Ryoma and Tezuka's faces, really nice! XD And hilarious too! I really like all these wallpaper. the picture behind quite rare. I really like this wallpaper and can't wait to download it. I like your art style too. It's so nice and sweet. I love they all look so cute i want to hug them all haha. Great work love the background as well. sugoi!!! its a nice wally, they all look so cool together, especially my kaidoh-sama, he looks the coolest!!! Kakuui!!!! I love it~! tee he he..
are the pictures from an ep or something!? if so which one please! Awwww sooo cute~ Thank you for sharing! FIRE~~~~~~ my brother likes this animation..